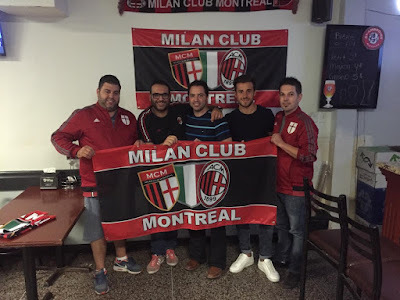 Last week, Marcello from the Milan Club Montreal wrote a public letter outlining his frustrations about the availability to watch Milan games outside of Italy. His concerns were things I think we can all relate to. Not just the added costs we have in trying to view Milan games, but even just the availability and quality. For example, despite contacting multiple people in Italy, he still doesn’t know if the Supercoppa will even be broadcast at all in North America. Compared with the relative ease and accessibility with which Italians have to Milan games and programming, it’s enough to make the rest of us fans feel like outsiders. Great that these kids could easily watch at home or go to San Siro, but what about my kids? We live in an age of instant gratification, thanks in large part to the internet which has facilitated the ability to share information freely and easily. Social media has enabled people from across the globe to come together, particularly those who have a common interest. In a fast paced world where information is just a click away, availability and access to content is key for any business to drive customer engagement. The same applies to Milan and its fans all over the world. We are in 2016, yet despite advances in technology and globalization, access to Milan games and content on demand for rossoneri fans outside of Italy leaves much to be desired. 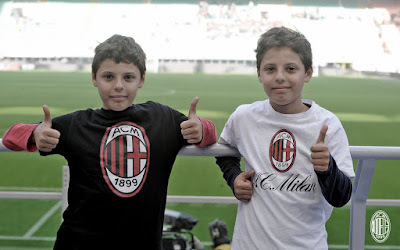 We are still operating in an old age model, where Milan fans are divided in two tiers. There are the Milan fans in Italy who have access to anything and everything Milan 24/7, and those outside of Italy who get whatever it is that is legally permitted to be shared outside the Italian peninsula. Having been a Milanista for over 30 years, it frustrates me a great deal to see very little progress being made. I can go on and on of what needs to be changed so I will limit my focus on my top 5 irritants. I will also refrain from discussing anything from the Serie A league, as that is another hot topic that merits it’s own article. 1. RAI ITALIA: It was in May 2005 that RAI was finally broadcast in Canada, much to the delight of our large Italo-Canadian community. 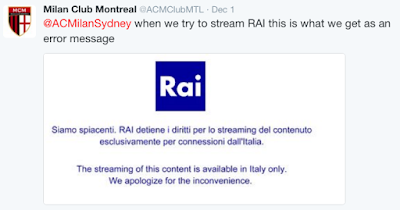 According to RAI Italia, over 90% of the Italian households in Canada subscribe to the channel. Eleven years later, while TV technology is advancing to Ultra HD 4K, we still get a standard signal that hurts your eyes when you watch RAI Italia. Italy is known for its great food, top designers and fashion sense, love of beautiful cars and passionate about calcio. What kind of image is Italy projecting with RAI still broadcasting on a standard signal? It is unacceptable to watch calcio matches that are not broadcast in HD. 2. Supercoppa: The Italian Super Cup (Milan vs Juventus) will be played on December 23rd in Doha, Qatar. We are November 30, and we still don’t know if the game will be broadcast in Canada. How is this possible? I tried contacting RAI Italia, and I was told “we are still waiting to know if we have the rights to broadcast outside of Italy, we will find out shortly.” The game is in three weeks, and they still don’t know if they have the rights to broadcast the game? I also tried to contact the Serie A league but didn’t get any answers. Showcasing Italy’s two most important teams in an official match is a great way to promote the clubs and the league. To get as many fans as possible to watch you need to properly promote the event and they have failed miserably in this regard. 3. Milan TV: Milan TV is the official channel of AC Milan, a 24/7 dedicated channel providing news, interviews, press conferences etc. which you can subscribe to only in Italy via SKY. Meanwhile in Australia, Foxtel provides its customers with a package that includes Chelsea, Liverpool and Manchester United TV. Why limit the amount of viewers for this channel? Why can’t it be accessible for Milan fans outside of Italy? Why can’t we watch it online via a paid subscription? 4. RAI online: RAI has a plethora of online content available for viewing, however it is only accessible for residents in Italy. Why this limitation? For those of us outside of Italy who pay to subscribe to RAI Italia (currently $7 a month) why can’t we access the online RAI content since we are paying customers? 5. beIN Sports: Ever since beIN Sports got the rights to broadcast Serie A matches, it has significantly reduced the availability of viewership for those who want to watch calcio with English commentary. In the past, games were broadcast on Telelatino (regular signal) and The Score (in HD). Those channels, for the most part, were included in packages or would be available for an extra dollar or two per month. With beIN Sports, you have to subscribe to this channel (currently $16 per month). There is also the option to watch online with beIN sports connect ($20 per month) this gives you more options as you can watch live events that are not broadcast on TV. I know of many people, myself included, that refuse to pay that amount monthly, especially since beIN sports focuses the majority of its marketing towards La Liga. In fact, there have been incidents where Serie A matches were cutoff in order to promote or broadcast La Liga matches, much to the dismay and anger of the Italian calcio fans. Other than marquee matchups of Serie A and some Champions League games, I only have one love, Milan. I have a hard time understanding how it is not possible for me to pay for a service that allows me to watch all Milan matches and other content, how I want, when I want. It is my sincere hope that once the sale of Milan is completed (enough with all these delays already) the new ownership will be open to new ideas and ways of doing things in order to give all Milanisti (both inside and outside of Italy) the opportunity to connect with the team by giving us full access to Milan content. Who would deny such devoted fans the right to watch Milan in something besides Standard Definition in 2016? Here in the U.S., I find it equally if not more frustrating as well as even more expensive just to view games. At one point, I was paying an extra $50 per month on top of my overpriced cable bill just to have access to most Milan games. But at least I could pay and see most games. My current cable provider doesn’t offer any channels at all that carry Milan games. Not even one. I can see some International games and some Champions League games (which obviously don’t include Milan these days,) if they are carried by certain channels. So I currently pay $15 per month aside from my cable bill for SlingTV Italian, which offers RAI and BeIN Sports channels, albeit not live. They are always 90 seconds to two minutes delayed (which makes it very difficult to Liveblog, and I also know about goals, etc. well ahead of time due to social media.) 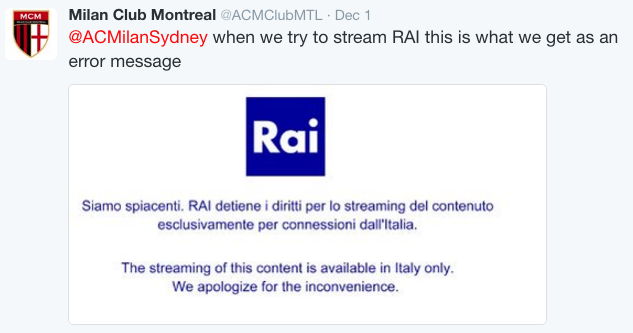 Additionally, neither RAI nor BeIn Sports carry every single Milan game. Friends outside the U.S. offer me friendly advice about streaming, as they are able for free or a low cost to stream all of the matches in HD with very few issues. That must be nice, but I live in the “land of the free,” where streaming is illegal. Not only is it even harder to find a working stream here that hasn’t been already been blocked by my freedom-promoting government, streams will be shut down midgame with notices that the content is illegal. I get that some of our goals or Donnarumma’s saves have been otherworldly, but not criminal. However, Marcello’s comments made me look around a little bit as to why those problems exist. First of all, RAI. I have always enjoyed the juxtaposition of their quaint programming, such as putting “Super Varietà,” an overly sequined compilation of Italian comedy and musical entertainment that spans decades, back to back with football matches. But the “standard” definition is actually incredibly substandard. And more so now in contrast with the various HD broadcasts available. I’ve literally had streams that were better. And why RAI wasn’t in Canada until 2005 is actually an interesting story that you would have to ask the Canadian government about. But despite the fact that RAI’s international channels are like the embarrassing uncle of ambassadors to the world, I don’t know how soon anything will change. RAI is state-sponsored broadcasting, there isn’t any competition, and I’m guessing any funding for improvement. The Mediaset channels that are sometimes available abroad don’t broadcast football. Which brings me to international rights broadcasting, such as BeIN Sports here in North America. In Italy, TV rights are divided up separately. The rights to international matches are governed by one group, the rights to Serie A matches by Serie A, the rights to Coppa Italia matches by another, then the rights to European matches governed by UEFA. Oh, yeah, and then friendlies. Totally different governing bodies, some with local control, others with European or global control. So you can imagine how difficult it is for even one club to have all of the rights to broadcast every game. But more importantly, once the international rights are sold, Serie A has no control over the quality or availability of Serie A matches to the consumer. Serie A’s current deal is with Media Partners & Silva, who bought all international broadcasting rights for €186m per year. They then in turn sell the rights in each country to a single broadcaster, such as BeIN Sports here. No one cares about their La Liga focus, or how many Serie A games they show live or not instead of infomercials or other leagues’ matches. And that is unlikely change no matter how much anyone protests, because in contrast to the international rights, the Serie A rights within Italy are worth €857m per year. No one is thinking about fans like you or I in other countries who may be willing to pay a pretty penny to watch more Milan and Serie A matches if they were just offered. They are focused on themselves and the easy market and thus money they know they have in Italy. As for MilanTV and RAI content online, I am guessing that international law and the stipulations of the international broadcasting agreements are the main reasons we are like outsiders to content like this. Not only that, but also all of the extra legal and financial resources it would require to have subscribers outside of Italy. Well, and there are countries like mine, of course, the land of the free, where content is strictly regulated. Who knows what would happen if Milan fans in the U.S. were allowed to watch Montolivo tie his shoes in training? We might even elect a reality star as a president. Oh, wait… But seriously, in addition to the egocentric marketing system of Milan and Serie A that is preventing them from gaining tons of potential revenue, I think there is enough international red tape to shut up even the most vociferous Serie A owners like Berlusconi, De Laurentiis, Ferrero, Lotito, and more. UPDATE: Marcello found out that it is possible for a club to provide access for fans outside of Italy to replays of every single game, Serie A or Champions League, etc., as well as club programming. For a year now, Roma has been providing this service via Roma TV+. Thus far it has been free, although there were implications it could be a paid service in the future. Your ball, AC Milan. Go. They can hang with Baresi at Casa Milan and they can watch games on TV. Where is the love for the rest of the world? UPDATE: Marcello confirmed that the Supercoppa will be broadcast on RAI in Italy, but it is still uncertain whether or not RAI International will carry it. Additionally, U.S. fans with decent cable or satellite providers will be happy to know that GOL TV is, in fact carrying the match here in the U.S. 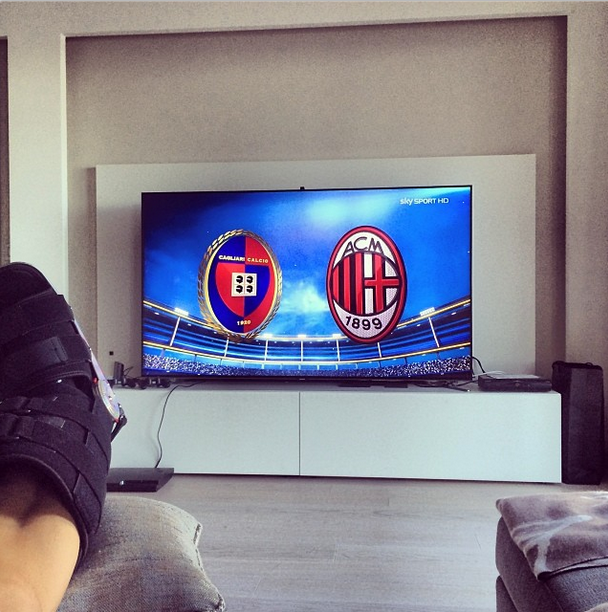 It is incredibly frustrating as a fan when all I want to do is watch Milan. It would be even better to have access to the same content as Italian Milan fans do. I wish I knew how much was international bureaucracy and how much was just a lack of foresight and ability to market. As Marcello mentioned, teams from the Premier League have found a way to market internationally. And their international broadcasting rights are worth over €800m for football that I like a lot less than Serie A. If Milan is ever sold at all, perhaps our new ownership will find a way to reach out to fans outside of Italy. But given their inability to close the deal in the first place, I wouldn’t hold my breath. I will say this, though. Milan and Serie A are missing out not only on my disposable income, but the passion which makes me wake up to watch Milan play a 19th place team at 3:30 in the morning. Italian Milan fans may have access to not only all of the viewing and online content, but they can also go to the stadiums. Those of us outside of Italy have to sacrifice more and get so much less. And yet we are treated like outsiders.